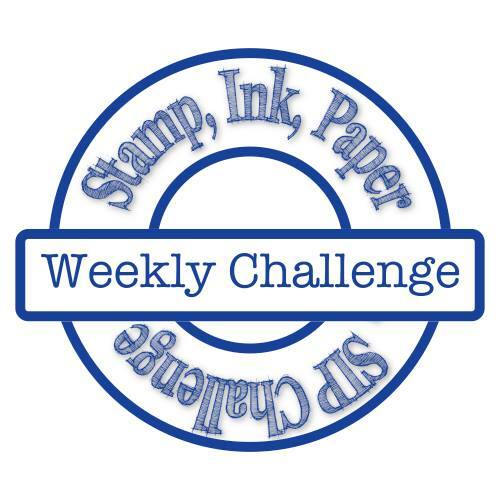 Welcome to the very first challenge over at our new site Stamp Ink Paper. Yes, its a brand new team I'm on. Let me introduce myself. My name is Carolyn and I'm an Australian hailing from Queensland on the North Eastern side of Australia. I have a little map. I'm in the pink zone and the closest capital city to me is Brisbane which I live north off, approximately a 2 hour drive away. You can click on the map to enlarge it if you wish. I am the only member from Downunder on this US based team headed by my good friend Justin Krieger of JK Cards. 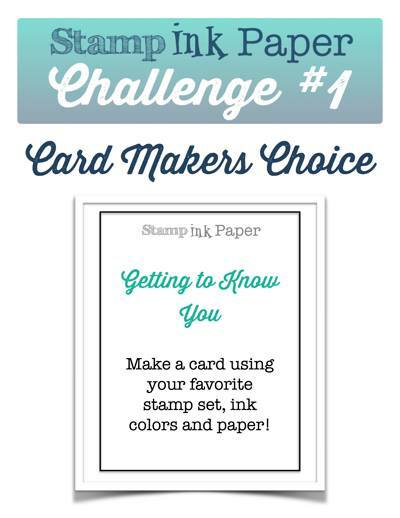 Our challenge was to make a card that is a reflection of our style & choices to get to know each of us a little better using our favourite things. We would love to know your favourites in this challenge too. Pls note the different spelling. I am an Aussie and we don't spell favourite the same as my fellow Design team members based in the US. Lol. Well Easel cards are right up my alley and my favourite thing to use in cardmaking is butterflies. I own just about every butterfly set Stampin Up has ever released. This card uses the Butterfly Basics stamp set and the Butterfly Thinlit die (medium). Purple is also one of my fav colours. This card uses Basic Black Perfect Plum and Whisper White card along with some (now retired) Back to Black designer paper and the Spring Flowers Embossing folder and Label Framelits to cut the White stamped panel. Here is the front view of my card. and a closeup to show the stamping and the texture of the embossing folder. Love these die cut butterflies. They always look like they are floating on the card. I used a retired Glimmer Brad to attach my butterfly to the Label framelit panel. With the side view, you get a better idea of how the easel stands, resting against the bottom panel with the greeting on it as the anchor. I just love making Easel cards of all shapes and sizes. 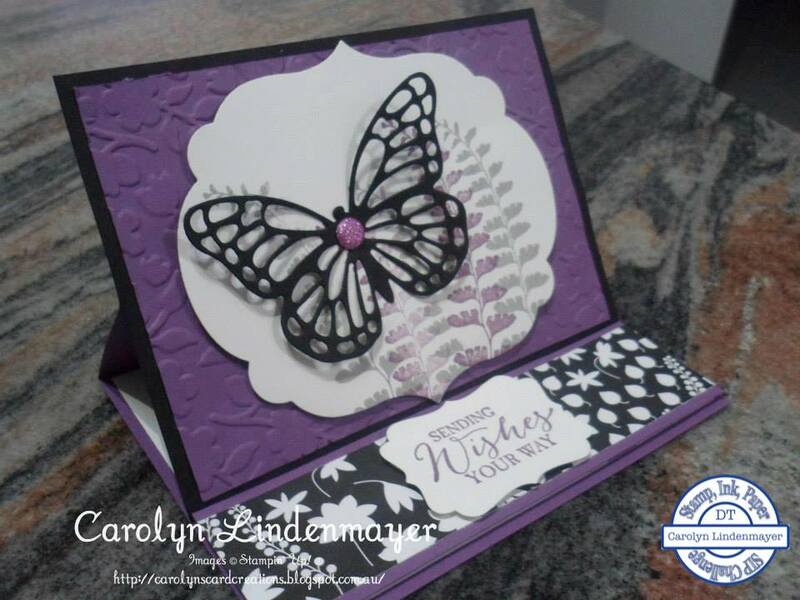 I love texture and regularly incorporate embossing into my designs and of course, butterflies. Here shows the inside of the card. and the view from the other angle. Thanks so much for stopping by to see my card, and perhaps getting to know this Aussie girl a little more, especially if you are a newcomer to my blog. 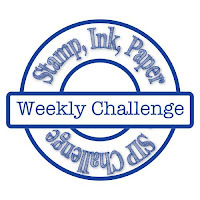 The challenges on Stamp Ink Paper each week will be sure to inspire you. You will love them. We look forward to you joining us soon. Carolyn this is gorgeous! I'm a sucker for a good fun-fold card, and the colors and layering are so beautiful. And of course that fab butterfly! Thank you so much Sandy. I am very much a Butterfly gal.